Like the Bluebell, this and the many other squills used to be included in the Lily family, Liliaceae. Following DNA analysis, they have been reclassified as members of the Asparagus family (Asparagaceae). These perennials rarely grow much taller than 10 to 15cm. The sky blue star-like six-petalled flowers 1 to 1.5cm across grow in spikes of typically 6 to 10 flowers each with a dark blue bracts at the base. Growing from bulbs, the curled basal leaves of Spring Squill are strap-like, varing in length from 2 to 15cm or so; they are typically 3.5cm wide. 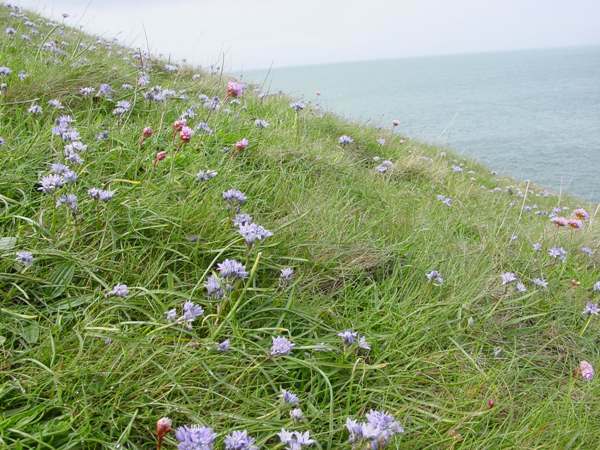 Spring Squill populations are in decline and these lovely plants can now only be found in Britain on the western coasts; they occur also on parts of the eastern coast of Ireland. Beside the coastal paths of West Wales you will findthese pretty spring flowers on dry grassy slopes. 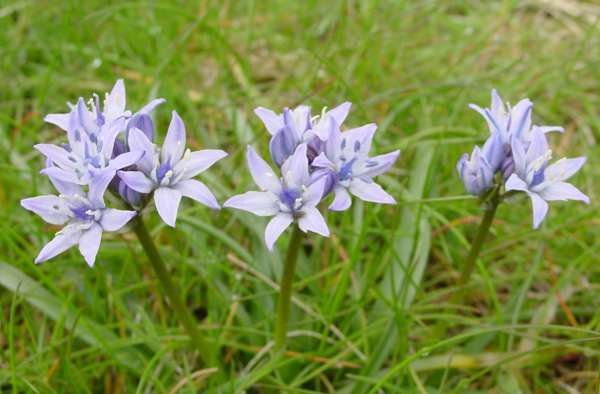 The best place to look for Spring Squill is short-sward coastal grassland that has not been disturbed by cultivation or treated with artificial fertillisers. Like most cliff-topwildflowers, Scilla verna is low growing and very tolerant of salt spray. Occasionally Spring Squill can befound also in grassy areas away from the coast. 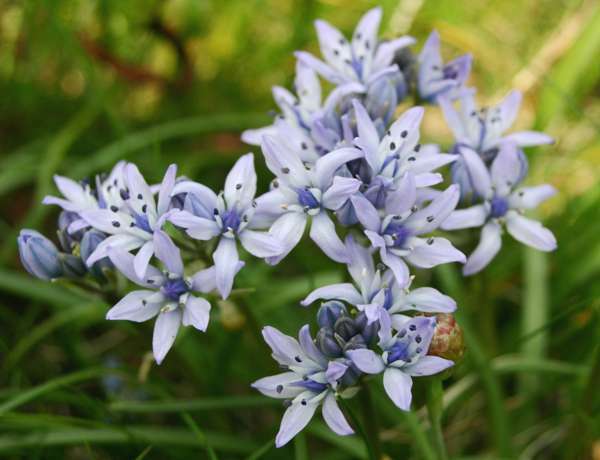 Spring Squill blooms from March to August but is usually at its best in April and May. When not in bloom the plants are hard tolocate because their curled leaves are very grass-like in appearance and they tend to grow most prolifically on short-sward grassland much of which is well trodden by sheep if not also by people. Scilla, the genus name, is the Latin word for these kinds of flowers; the specific epithet verna also comes from Latin and means spring - a reference to the time of year when the flowers of Scilla verna appear. Cultivated forms of Spring Squill are planted in parks and gardens as ornamental plants, but care is necessary because the bulbs are poisonous. Extracts from various kinds of Scilla bulbs are used for their medicinal properties, but caution is necessary where young children are present; the bulbs themselves must not be eaten. In Plantlife's 2002 'County Flowers' campaign Armeria maritima (Thrift or Sea Pink) was chosen as the county wildflower of Pembrokeshire. Spring Squill would have been an equally suitable choice, but in fact this species has been allocated to County Down, Northern Ireland. 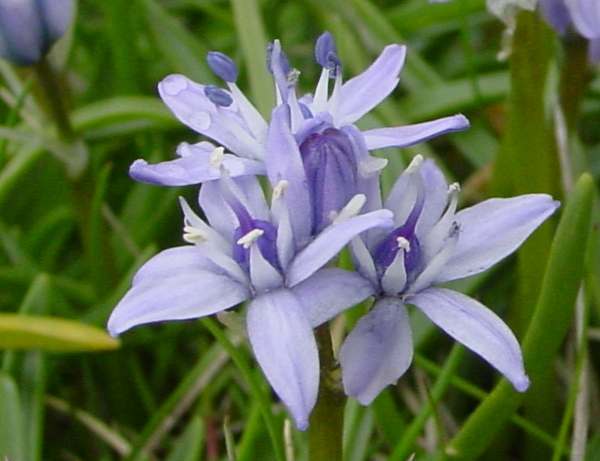 Scilla verna is the most widespread of its genus that occurs naturally in Britain, but it is not alone: Autumn Squill Scilla autumnalis, which produces purple flowers in taller spikes from mid summer until mid autumn, occurs in parts of southern England and Wales. In southern Europe Scilla bifolia, Scilla monophyllos and Scilla peruviana are three other fairly common squill species. The Spring Squill pictures shown on this page were taken on the Pembrokeshire Coast Path near Ceibwr Bay, just south of the Teifi Estuary in West Wales.